GoodSense Omeprazole Delayed Release Tablets 20 mg treats the same symptoms as Prilosec OTC. 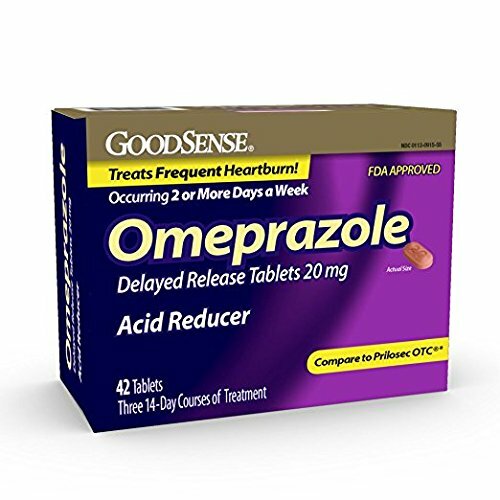 GoodSense Omeprazole Delayed Release Tablets 20 mg is a Proton Pump Inhibitor (PPI), the newest class of heartburn medications. PPIs actually deactivate the pumps in the stomach lining from producing acid, significantly inhibiting acid production (and its overproduction) at the source. PPIs are available over-the-counter or as a prescription to treat ulcers, gastroesophageal reflux disease (GERD) and erosive esophagitis. PPls include store-brand Omeprazole Delayed Release Tablets 20 mg (treats the same symptoms as Prilosec OTC) and Lansoprazole Delayed-Release Capsules, 15 mg (treats the same symptoms as Prevacid 24HR) to treat frequent heartburn that occurs two or more days per week. These products may take 1 to 4 days to work initially and are not indicated for immediate relief of frequent heartburn. Over-the-counter PPls such as Omeprazole Delayed Release Tablets 20 mg and Lansoprazole Delayed-Release Capsules, 15 mg should be used as a 14-day course of treatment every four months. You should not take PPls for more than 14 days unless directed by your doctor.